Jon has spent over 25 years in the book business--and over 16 years at Amazon.com—buying, selling, and writing about books. He enjoys narrative nonfiction, literary fiction, and adventure and nature writing, especially books about bears. 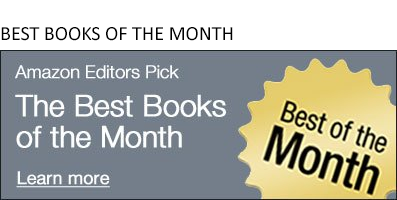 In this month's picks for the best true tales: We catch up with the "comma queen" and her adventures in everything Greek; a gripping, decades-old cold case investigation; a thrilling look back at the Apollo Moon landings; a deep dive into our inherent biases; and a last collection from a beloved scientist and storyteller. Judges selected the final six from a list of 108 books written across 25 languages. What do you do when a friend hands you a book by a celebrated psychotherapist called Maybe You Should Talk to Someone and exclaims, "This is a book for you!”? You read it, obviously. Whether you're a first-time viewer or a fanatic from way back, here are four deep-diving companions to some of television's best, most iconic series from the last 20 years. Have a thirst for adventure? Here are a few spring books to get you dreaming about late sunsets, dusty trails, and wide-open spaces. March is stuffed with great biographies and memoirs. Here are 10 of our favorites. These brothers work through their childhood disappointments as industrious kids do, even if they're now legal adults: Puerile vandalism. Don't let the apparent darkness of these titles deter you. Need something good for your commute or the treadmill? Last night in New York City, the Audio Publishers Association revealed their judges' selections "recognizing distinction in audiobooks and spoken-word entertainment." Amazon Book Review Podcast: Truth in Advertising - Or at Least Publishing? And The Barefoot Contessa! Did Dan Mallory hurt our feelings? We attempt to unravel our thoughts about the real person behind "A.J. Finn" and The Woman in the Window, plus an interview with Ina Garten about her latest book, Cook Like a Pro. This week marked the 100th anniversary of the designation of Grand Canyon National Park. (The canyon itself is actually much older.) Here are seven books to celebrate the centennial. Sally Field, Trevor Noah, and others offer eye-opening views into their private lives.